Many homeowners will at some point experience worn out or broken garage door torsion springs that must be replaced. The average torsion spring lasts for about 10,000 cycles of opening and closing the garage door. This is because of the amount of pressure that is put on these springs on a regular basis. If you are in need of a garage door torsion spring replacement, there's no better place to look than at Star Door Parts. Here you will find hundreds of unique garage door torsion springs to choose from. We have the most common size springs in-stock for immediate same-day shipping. Our replacement torsion springs are compatible with top name brands in the garage door industry including Wayne Dalton, Midland, North Central, Raynor and more. When you shop at Star Door Parts, you can be sure that you are purchasing high-quality garage door springs made in the USA from the highest grade of steel that is coated to resist corrosion. All springs come assembled with standard cones. If you have any questions about our torsion springs for residential garage doors, how to order online or if you are looking for a spring with a different interior diameter (ID) other than 1 3/4" or 2", please give us a call at (952) 818-6633 or click here to contact us. We’re happy to help! Same day and expedited shipping is available! Recently Star Door Parts was featured in The Family Handyman© September 2014 magazine article on "Advanced Garage Door Repairs" that show how to safely and properly replace a torsion spring. Click here or on The Family Handyman© magazine logo below to read the article. 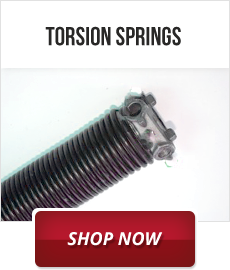 Click on the tape measure to learn how to properly measure your torsion spring and then click on the proper ID size above the image of the spring and then select your wire size to see the largest selection of torsion springs on the web. Garage door torsion springs, cables, brackets, and other hardware attached to the springs are under very high tension and, if handled or installed improperly, can cause serious injury. For safety and other reasons, Star Door Parts recommends that only a qualified, licensed professional install or adjust torsion springs by carefully and properly following the manufacturer's instructions also using the proper specialized tools required. Star Door Parts and Southwest Garage Door, LLC disclaim any and all liability, including any obligation or liability under indemnification agreements with distributors or retailers, for death, personal injury, expense or property damage incurred by consumers or anyone else who attempts to install or who installs torsion springs, parts, etc., purchased from Star Door Parts.